Yep, it is that time. Time to start putting some of the summer things away (Thank God I live in the South. I do not want winter...70s are perfect. 90s, yeah, ok...not so much. But NO SNOW) and time to start pulling out the school supplies and go through the fall clothes. I'm sure some people might be ready to put out pumpkins (Ahem, Hobby Lobby needs to slow it down. They already have Christmas stuff out...), but us? Not just yet. A change in decor was needed a bit, though. 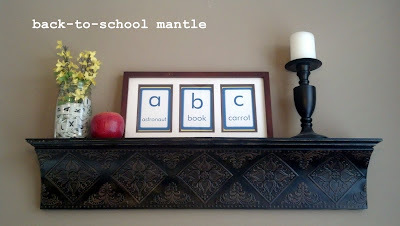 And, here is out back-to-school mantle! And the awesome thing? This was a $0 change!! Fake apple - it was on the top of my cabinets in the kitchen. 3 window frame filled with flash cards - from from previous gallery wall in living room; flash cards from a deck I used last year with Andrew. No money, no problem. You what you have in the house! So cute thanks for linking up! Thanks! I am headed your way now! Oh My! So cute and creative! I hope you will link up tomorrow to The CSI Project starting tomorrow. The challenge is Back to School Projects. You just might win. 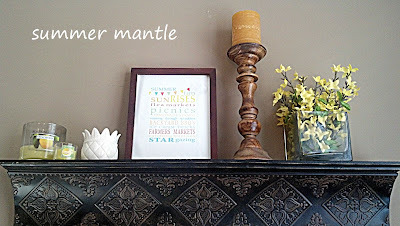 Each week is a new challenge with 3 tutorials, giveaway and a fun guest judge. Sounds like fun! I will definitely stop by! Thanks!